If you walked through my front door, you would see my dining room immediately to your right. If you walked through my front door today, you would see sunglasses, a backpack, a camera, keys, and a bag from Michaels that has been sitting on the dining room table for the past two weeks. Perhaps you can relate. Last week I introduced a new series at Always Orange called Always Orange at Home. Each week I am writing about a different room in my house. This week my focus is the dining room. I really like my dining room. It is one of the rooms in my house that feels finished. I have a farm table that I love, a wall color that I chose, drapes for the window, and decorative pieces on the wall that reflect my style. I can still recall the paneled dining room in the apartment Brad and I lived in as a newly married couple. Thank goodness the apartment came partially furnished because otherwise the space would have been empty. As it was, I think we inherited the landlord’s old table and chairs. In my mind’s eye, I can see the red velvet pattern on the chairs and the vinyl-lined drapes at the window. In spite of the less than ideal decor, we hosted friends for dinner in that space and also a Christmas dinner in our time there. I wrote last week about the fact that hospitality and extending grace can happen in the kitchen and isn’t reserved for the dining room or living room. 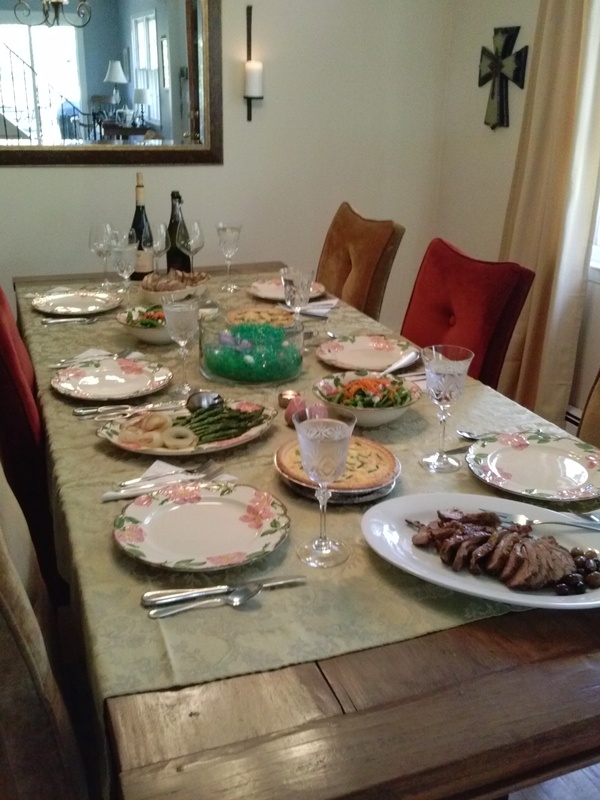 Yet something special happens when we move to the dining room to sit down and enjoy a meal. We experience a deeper, even sacred, kind of hospitality and grace. The rush to put the finishing touches on a meal is over and now everyone can pause and sit for a bit or for a while. This attention to detail shouldn’t be just for guests. We can light candles and set the table even on an ordinary Wednesday night. And don’t think that YOU have to do all of this! Involve others—someone sets the table, someone else lights the candles and arranges a table display. Sharing a meal in a dining room is another way to encounter God’s presence in our everyday lives. As we pause to talk and eat together, the Holy Spirit is present. Shove the collection of work bags and library books to the side and take time to sit at the dining room table. Lastly, don’t save your china for only special occasions. Surprise those gathered around your table by using your best dishes for pizza or pasta. The looks of surprise will bring a lift to your heart as well. I’m having fun scrolling through some of your archives. Thanks for this lovely post!